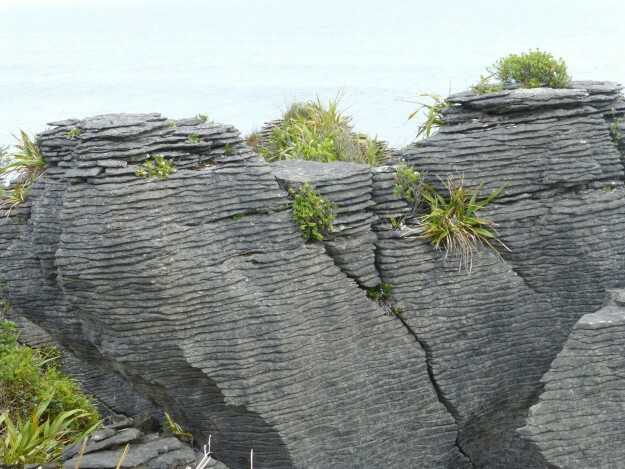 The Ancient and Mysterious Pancake Rocks of New Zealand. …and a big stack of pancakes. 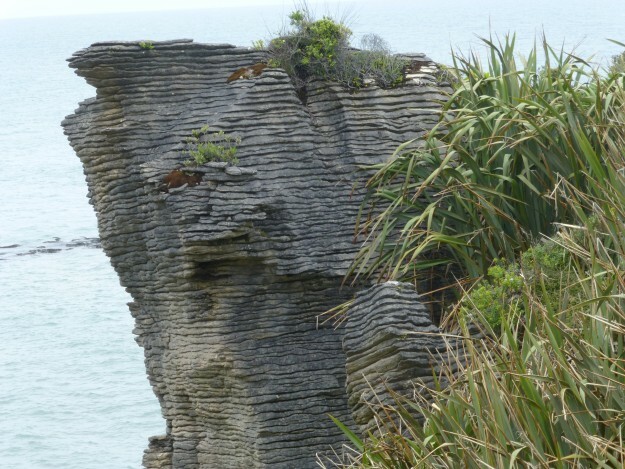 More stacks of Pancake Rocks. The Pancake Rocks have a bit of mysterious allure to them as well. While scientists and geologists have figured out they are limestone created 35 million years ago under the sea by fragments of marine organisms thanks to a massive amount of mud and sand pushing down into the seabed with so much force the organisms turned into limestone. One thing geologists can’t quite comprehend, though, is why the limestone decided to stack up on top of each other in pancake-like layers. 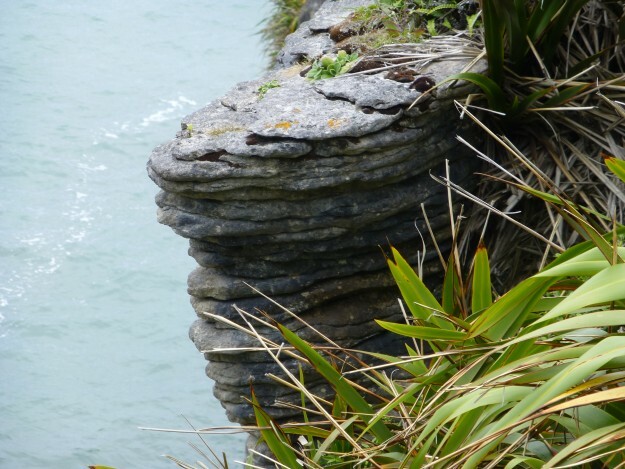 It’s generally believed stylobedding, which is the result of mudstone being compacted between layers of limestone due to the pressure of the sea; thanks to the mudstone being eroded faster than limestone over the years, the Pancake Rocks get their stacked effect. 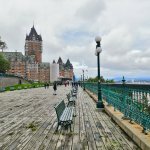 Geologists still aren’t sure why some minerals escaped the limestone to create the mudstone during the creation process. These stacked rocks used to be marine organisms underneath the sea. 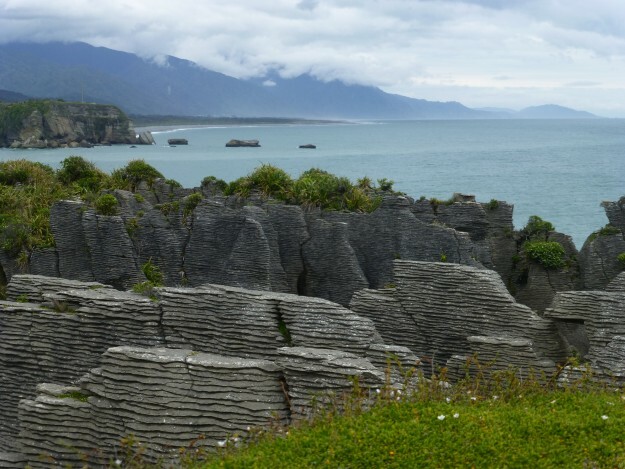 Despite being created millions and millions of of years ago, it wasn’t until 100,000 years ago that the Pancake Rocks emerged from the water’s depths, due to an uplifting process in the earth that began five million years prior that also pushed up the Southern Alps. 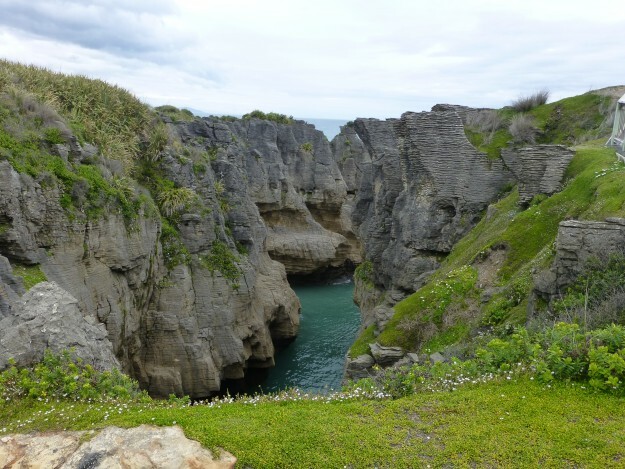 Thanks to the uplifting process, visitors now have gorgeous views like this from the Pancake Rocks. Amidst the many piles of rocks making up the Pancake Rocks park are blowholes. 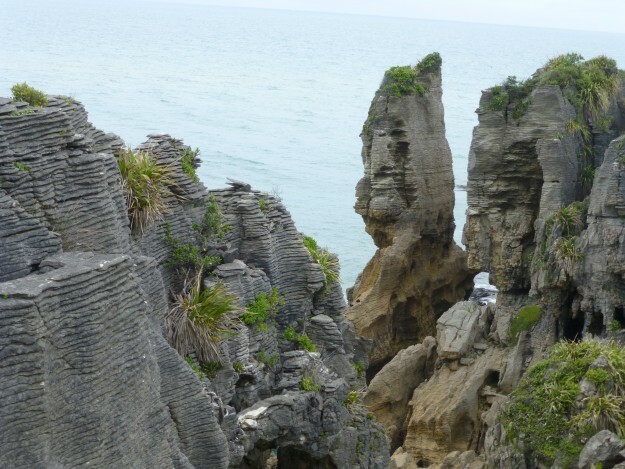 Show up to Pancake Rocks on the right day time and time when conditions are right, usually around the time the tide is coming in, and you’ll see water swishing up through the flat rocks and making a large whale spout type spray above the gleaming rocks. One of the blowhole areas. The Pancake Rocks park is easy to get to as it’s just off the road with plenty of parking across from the entrance. A culinary name for a popular park needs food to go with it and there’s a restaurant and café across the road from the entrance to Pancake Rocks. 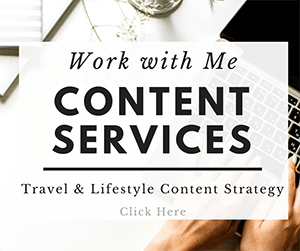 If it’s too overpriced and touristy for you, head north to Westport or south to Greymouth for some eating establishments away from the hordes. 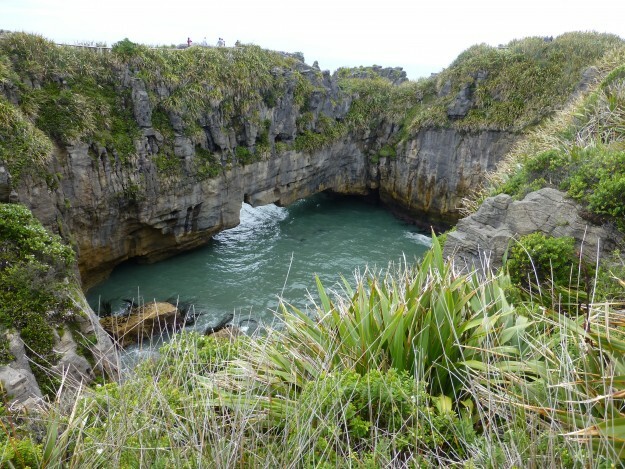 Punakaiki also is home to hiking trails and is a great jumping off point for kayaking in the sea. 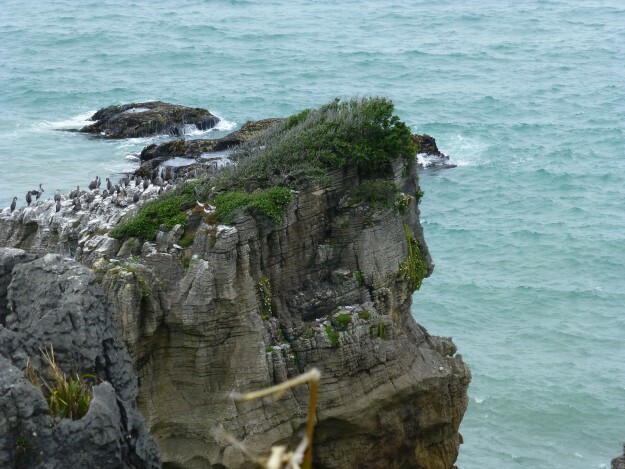 Birds love the Pancake Rocks, too.